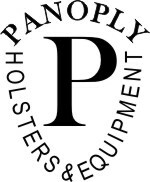 If you would like to order a Panoply holster or equipment please completely fill out the order for below. Please note that because each holster is custom made there is a minimum three week waiting period. We will send a confirmation of your order to the email you provide. Please include a phone number. Our goal is to provide the best holster to fit your needs, therefore we may contact you to ensure our product lines up with your expectations. Each of our customers is unique in their needs and use and we want to help you find the best holster for your goals. When we are ready to begin work on your holster we will email you an invoice for your purchase. You can pay online or you can mail us a check. All orders must be paid in full before shipping. Please note that all holsters are made to achieve a secure fit with factory standard guns. Panoply is not responsible for ineffective fit of firearms that have been altered from their factory standard. Please contact us prior to ordering a holster for an altered gun.